← Who’s Reading “Rogue Island” Now? It’s Actor John Lithgow! 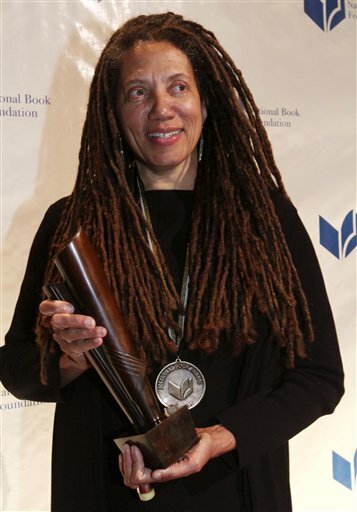 Nikky Finney’s speech when she accepted the 2011 National Book Award for poetry is the best acceptance speech I have ever heard. The way it echoes down the generations, and the simple elegance of the language, both touched and inspired me. You can listen to it here — and you should. It is not to be missed. Advance to the two-minute mark of the video to get directly to her. The voice you will hear shouting “Yeah Nikky!” as the winner takes the stage belongs to another of our greatest poets, my wife Patricia Smith. BTW, the second-best acceptance speech I ever heard was when John Larroquette got his Emmy. He pranced up to the microphone, raised the feminine statuette over his head, said “I’ve always loved short women,” and left the stage. This entry was posted in Uncategorized and tagged Bruce DeSilva, Natioal Book Awards, Nikky Finney, poetry, Rogue Island. Bookmark the permalink.